Well, it took 35 years, but I finally got my dream vacation to Paris. Of course, with it being the 50th Anniversary of Doctor Who, I just HAD to work in a visit to England—and did I GEEK OUT. I hope you enjoy the accompanying photos of the TARDIS at sites related to Doctor Who episodes; I certainly enjoyed taking them. My first opportunity was at the Louvre, where you can just barely see the Mona Lisa, cordoned off behind thick glass. And no, I didn’t have a chance to check for “this is a fake” written behind the canvas, although I tried (and failed) to figure out a way to take a picture making it look as if it did! My first night in London I arrived at my hotel late, exhausted, and hungry, but the lit-up skyline view outside my window more than made up for the four flights of stairs—the famous clock tower perfectly encircled by the London Eye. I had a list of 29 things to do and see in Great Britain, most genre-related, and managed to get to most of them. It helped greatly that the bus tour I took my first full day there drove past quite a few of my planned sights, hence the pictures of Buckingham Palace, the London Eye, the Shard, and the clock tower commonly referred to as Big Ben. For the photos of The Globe Theatre and the Abbey Road crosswalk I took the Tube and walked. Public transportation in London is incredibly convenient, and a lot of sightseeing can be done on foot. Obtaining the photo at Stonehenge involved a train ride to Salisbury, then a tour bus out to the site. This got me halfway to Cardiff, home of the Doctor Who Experience and the next stop on my vacation, but more about that next month! Although there is a bus stop within sight of the Doctor Who Experience, I got out at the millennium Stadium (familiar to Torchwood fans) to enjoy the walk around Cardiff Bay. The DWE brochure—printed in English and Welsh—included an excellent map, and signs pointed the way at regular intervals. It was a lovely stroll by a fascinating shore, with several artistic memorials along the way. As I approached the building, a young Asian tourist was having her picture taken by the entrance sign—a reminder of the show’s global appeal. 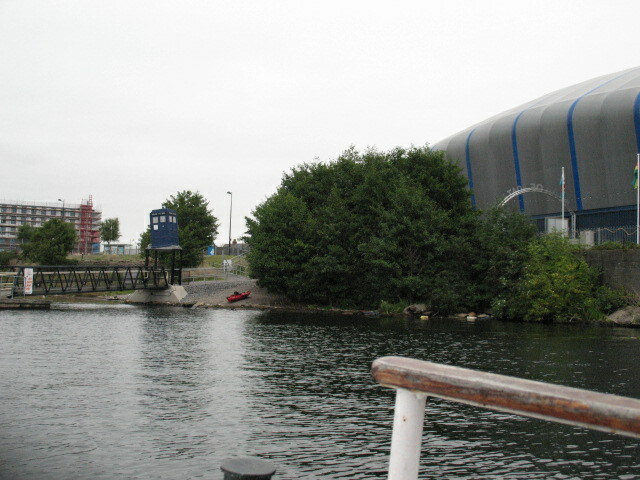 Outside the attraction, a TARDIS appeared to be precariously perched above a nearby dock. Inside, the lobby and eatery (aptly named The Blue Box Café) were decorated with murals of Cybermen, Davros, Weeping Angels, and the Master. A life-size Lego Dalek stood in one corner, Bessie was parked by the window, and display cases showed off various props and collectible merchandise. Gumball-style machines dispensed small toys, and a penny press gave one a choice of the TARIDS, K-9, or a Cyberman coin. The Doctor Who Experience is really two attractions in one: an interactive adventure with the Doctor, and an extensive exhibit of Doctor Who sets, costumes, and props. Our group queued up and entered the Experience, which began with the Eleventh Doctor, on video, appealing to us for help. Well, actually, he was trying to reach Amy, but he settled for us. We went through several different sets, from an old museum filled with random but recognizable items from the Doctor’s past, to the TARDIS console room (I got to ‘navigate’), to an alien spaceship, and into a forest. Several of the Doctor’s foes threatened to defeat us, but we prevailed, freeing the Doctor and earning his thanks. After the interactive adventure, we entered the exhibit, with the first ten Doctor’s costumes on display. Some were original, others ‘restored’ originals or replicas, but all were represented. There were multiple TARDIS console sets, a variety of sonic screwdrivers, and an incredible number of costumes and props, from the early days right up to the most recent season. You could even get your photo taken in front of a greenscreen and choose from several alien backgrounds for the finished picture. Upstairs there were even MORE costumes and props, including most of the aliens from Matt Smith’s tenure. There was a section featuring the Radio Times’ Doctor Who covers, reminiscent of the exhibit at the Museum of London. Several Time Lord robes and headdresses from different eras were featured, and wigs and masks from many different episodes. The larger items were especially impressive: the wooden King and Queen, Melkur, the face of Boe, the TARDIS, the Pandorica, a plethora of Daleks, and a tableau from “The Snowmen.” My favorite exhibit, however, was rather small: the Doctor’s cradle. I exited through ‘a little shop’ with every type of Doctor Who merchandise you can imagine. I especially liked the jigsaw puzzle based on Vincent’s painting. Back in the lobby, I waited for the Doctor Who Walking Tour to begin—but that’s a story for the next issue! The Doctor Who Walking tour left from the Doctor Who Experience with our Amy-like (slim, young, attractive, and redheaded) guide. The first thing pointed out was the back of the film studios, which sometimes–but unfortunately not that day–offer tours inside. Some scenes from Voyage of the Damned were filmed on the site where the Doctor Who experience itself currently sits. The vacant lot beside the Experience was the location for the scene of the car driving into the retention pond in the Atmos episode. While not used for a scene in Doctor Who, we did also see the Norwegian church where Matt Smith began his Olympic run. 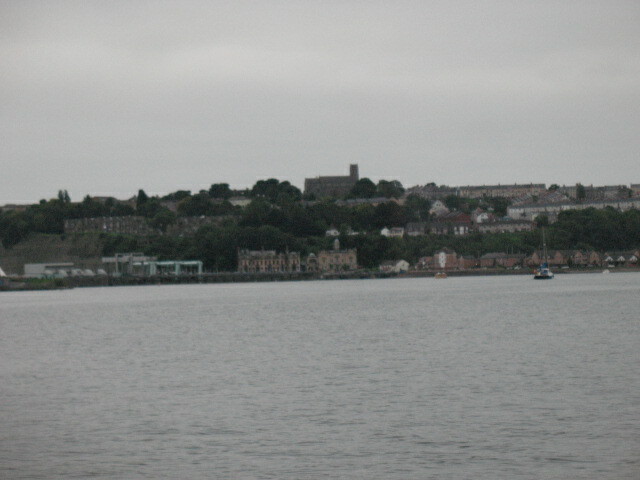 Across the bay, viewed from afar, was the area where Turn Left and some scenes from Daleks in Manhattan were filmed. 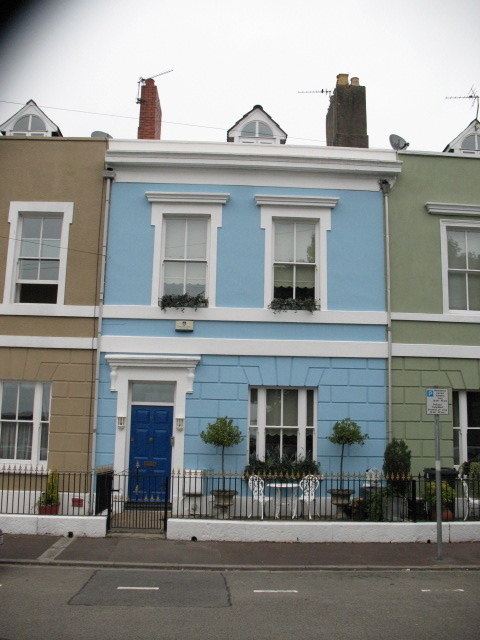 It also contained the neighborhood where Sarah Jane Smith lived, named Bannerman Road after Delta and the Bannermen. A nearby restaurant was used in Runaway Bride and for a Torchwood exterior. For the Torchwood scene, 30 tons of sand were brought in, but rain washed it away overnight and more had to be brought in the next day. Another building provided the outside glass staircase of the proposal scene with Donna in The Runaway Bride. 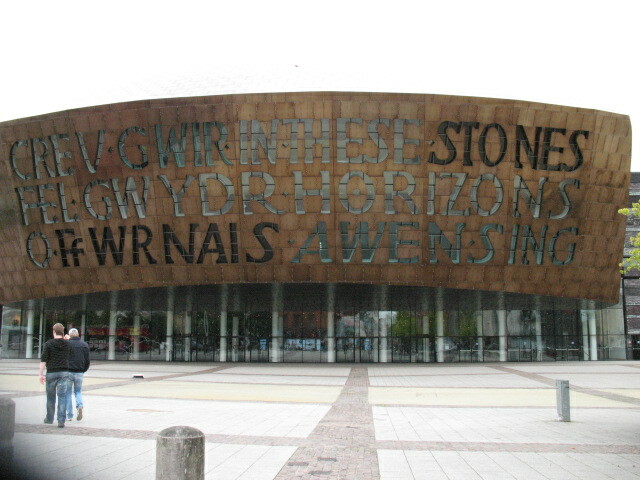 Millennium Centre itself was used as the New Earth hospital, with the elevators providing the decontamination chambers. There actually is ‘a little shop’ off the Centre lobby, but it was CGI’d out at the beginning of the episode. The Centre was also used for The Girl Who Waited and The Sound of Drums, in the latter providing the staircase on which the Master announces “What this country needs is a Doctor.” The front of the Centre provided the museum at the end of Vincent and the Doctor. Other buildings in the area were used in Day of the Moon, Doomsday, New Earth, Love and Monsters, and Boomtown. One building with an impressively large door was used as the police station in Blink, where actresses posed as Weeping Angels in the windows. I saw the outside apartment stairs filled by the supposed ‘jumpers’ with the same blood type in The Christmas Invasion. Our guide explained that one particular street in Cardiff often doubles for London scenes, simply by adding red items such as a mailbox, phone booth, or waste bin. Apparently, audiences associate the color with London. 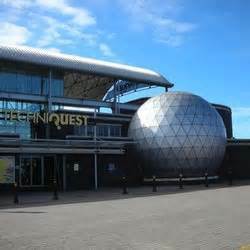 At the farthest point of our tour, we saw the Techniquest building, which features an outside accent looking remarkably like a Sontaran spaceship. Our guide explained that we would not be going to Amy’s house, as it was too far to walk, but that the Cardiff Bay boat tour operator might go by it if asked. We headed back toward the Doctor Who Experience, seeing more sights (and sites) on the way. These included Eddie’s Diner, which was used to represent an American diner in the ‘60s in The Impossible Astronaut (yummy onion rings!). 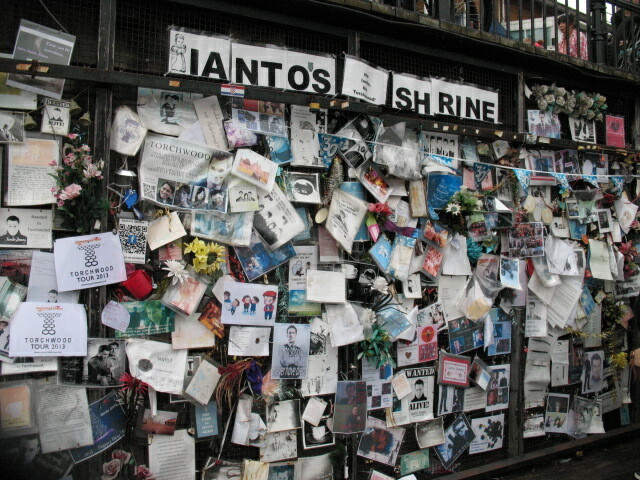 The last place we visited was Ianto’s Shrine, which was covered with messages for the sincerely missed character. Someone had even hung a suit on the fencing a while back with a note which read, “It’s been four years, please pick up your dry-cleaning, Mr. Jones.” The suit had worn away to tatters, with help from the local seagulls. The boat tour operator was not able to go past Amy’s house, as the theme for that day’s tour was Pirates of the Caribbean, but he gave me excellent directions and I found it easily. With the tour over, I had completed all but one of the items on the “5 Things Every Who Fan Should Do in Cardiff” list my daughter found on the Internet for me. The last was to visit the Bar Cwtch, which unfortunately I forgot to ask directions to; but then, I couldn’t have pronounced it anyway!